Night turned briefly into day over a wide area in California and Nevada at 5:21:44 a.m. PST on Thursday morning January 17th, creating hopes of another extraterrestrial surprise delivery of meteorites, but this bright fireball did not drop meteorites on the ground. This was a head-on collision with a small perhaps 1-meter sized comet, rather than the glancing blow of a stronger asteroid. The comet matter was almost instantly turned into dust and gas. Sunnyvale record of the January 17 fireball. The beginning of the meteor trajectory is visible right of the bright flash that originated well below the field of view. 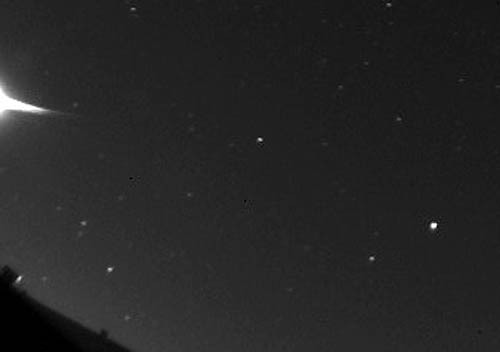 The fireball that lit up the predawn Northern California sky in late January was a small comet that hit Earth head-on when it hit the Earth’s atmosphere, a researcher said. The comet “instantly turned into dust and gas,” resulting in the flash of light seen by many at 5:21 a.m. last Thursday, said meteor astronomer Peter Jenniskens, a scientist at the Seti Institute in Mountain View. 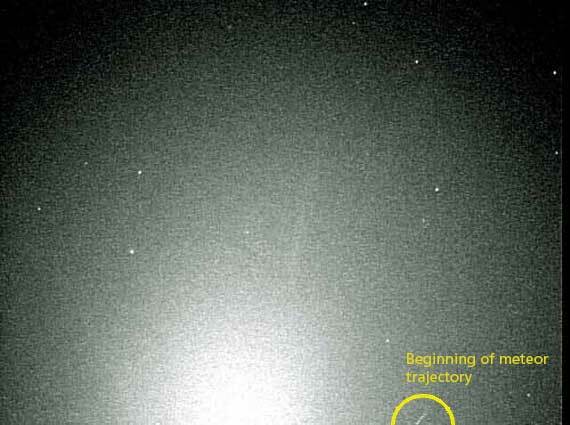 “Because the comet vaporized, no pieces fell to Earth,” Jenniskens said. The comet came into contact with the Earth’s atmosphere just north of Yosemite National Park at a speed of 160,000 mph, Jenniskens said. “Moving toward Lake Tahoe, the small comet then penetrated to lower elevations where it fully disrupted in the atmosphere,” Jenniskens wrote Tuesday on his group’s website. The sight was a treat for those up and about before dawn. Reports of the sighting came in from around California and from outside Reno. It was the second cosmic sighting in the Bay Area in three months. On Oct. 17, a monster fireball lit up the skies, and several chunks of it – meteorites – were later found in the Novato area. Three of the CAMS camera stations captured the very early stage of the impact. 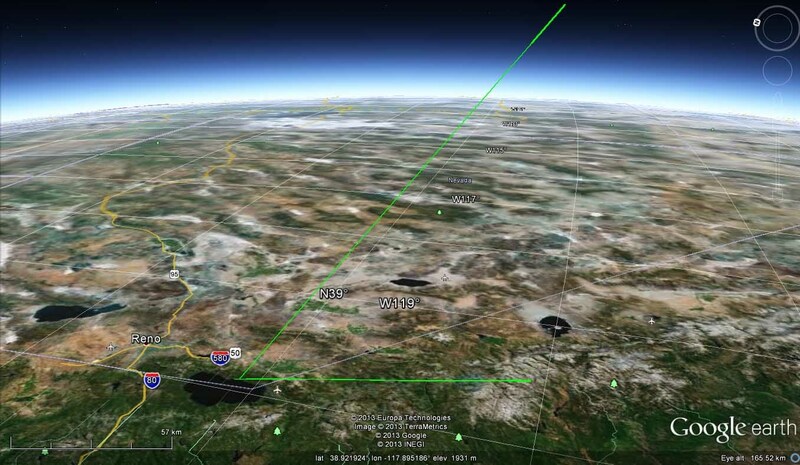 The meteor was first spotted by the station at Lick Observatory at an altitude of 146.1 +/- 1.0 km (90.8 miles) and was tracked at the stations in Sunnyvale and Fremont Peak Observatory down to 133.8 +/- 0.2 km (83.1 miles), after which the fireball moved outside the field of view. Extraction of the short fast tracks proved difficult, but CAMS software architect Pete Gural succeeded in extracting each track. From triangulations of these video records, the object’s trajectory in the atmosphere and orbit in space were calculated. How high is 146 km? 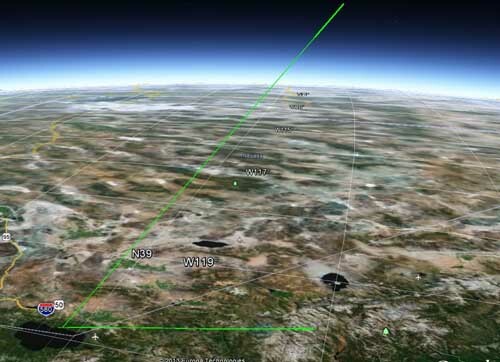 The short thick line shows the calculated trajectory, the thin line is extrapolated to the ground, ending close to Lake Tahoe. Image courtesy of Jim Albers. The meteoroid originated from the Oort cloud and approached Earth on a shallow 19 +/- 7 degrees inclined orbit, moving in opposite direction around the Sun. On Thursday morning, while approaching it’s nearest point to the Sun at 0.98 +/- 0.03 Astronomical Units, it found Earth in its way. It approached from the direction of the constellation Virgo, and collided head-on with the Earth at a location just north of Yosemite National Park, entering Earth’s atmosphere at the fastest possible entry speed of 72 +/- 6 km/s (= 45 miles/s, or 160 thousand miles per hour). Moving towards Lake Tahoe, the small comet then penetrated to lower elevations where it fully disrupted in the atmosphere. 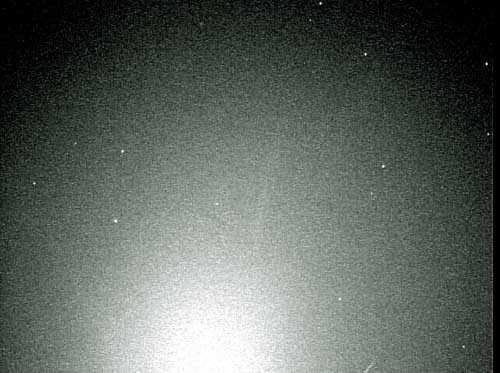 January 17 fireball in an allsky camera image by Jim Collins at Chico, CA. The fireball was widely reported on the American Meteor Society website. It was captured on the allsky camera of Jim Collins in Chico, CA (photo above). It was also captured on the Skysentinel cameras at Stanford and Nevada city. Those sites show videos.